Your angels. Your faithful companions. 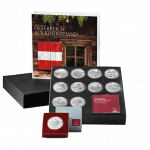 Consisting of the angels Michael, Gabriel, Raphael and Uriel, each coin in this full set is struck in Uncirculated quality. 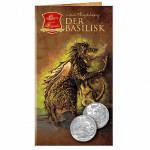 Buy these four talismanic coins for yourself or as a faithful companion for someone dear to you. 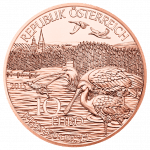 By giving these coins, you communicate the message that while you cannot always be with this person, the angels will most definitely be there for them. 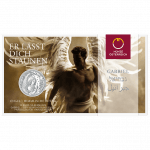 Featuring the angels Michael, Gabriel, Raphael and Uriel, each coin in this set is struck in Special Uncirculated quality and comes in a protective blister pack. 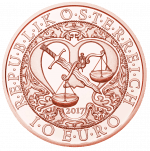 Buy these four talismanic coins for yourself or as a faithful companion for someone dear to you. 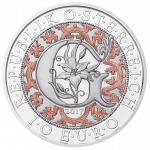 By giving these coins, you communicate the message that while you cannot always be with this person, the angels will most definitely be there for them. 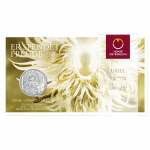 The only angel in the Austrian Mint’s interfaith Guardian Angels series not recognised as an archangel by the Roman Catholic church, Uriel, the subject of the fourth coin, comforts us in dark moments, gives us energy and helps us find the joy in life. From Judaism to Zoroastrianism and from Christianity to Islam, through the ages people of many faiths have looked to angels for protection. 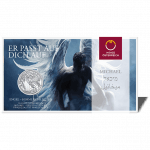 Michael – the Protecting Angel is the first coin in the Austrian Mint’s talismanic four-coin Guardian Angels series, which draws on art history and state-of-the-art colour application technology to celebrate these benevolent but invisible beings. 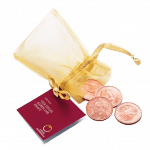 Not only superbly crafted historical masterpieces, Guardian Angels are pocket-sized lucky tokens that will make you feel someone is watching over you. From Judaism to Zoroastrianism and from Christianity to Islam, through the ages people of many faiths have looked to angels for protection. 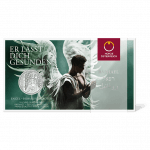 Michael – the Protecting Angel is the first coin in the Austrian Mint’s talismanic new four-coin Guardian Angels series, which draws on art history and state-of-the-art colour application technology to celebrate these benevolent but invisible beings. Not only superbly crafted historical masterpieces, Guardian Angels are pocket-sized lucky tokens that will make you feel someone is watching over you. Crowned with a final coin depicting Austria in its entirety, our charming ten-coin Austria Piece by Piece series includes nine other coins that each feature a drawing by primary schoolchildren of the province they call home. 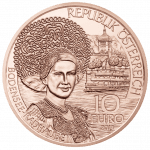 On the other side, the coins boast an expert depiction, crafted by our world-renowned coin designers, of a UNESCO World Heritage site or a manifestation of “intangible” cultural heritage in the form of ancient traditions from each province. 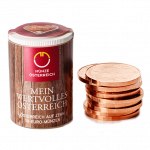 Now that our epic Austria Piece by Piece series has drawn to a close we are issuing all ten copper coins individually wrapped inside a special face-value gift pack. 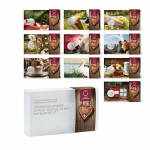 History, culture and landscape, together with other elements, combine to form the special character of a country. Like most countries, Austria has the first two in abundance, but one of the things that make the country truly unique is how synonymous it is with its spectacular landscape. 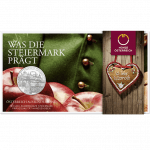 From the spectacular peak of the Dachstein to the UNESCO World Heritage beauty of the lakeside town of Hallstatt, from the banks of the Danube, the Traun and the Inn to the Bohemian Forest, Oberösterreich (Upper Austria) has something for everyone. 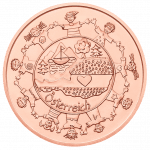 Featuring on the ninth coin in the Austrian Mint’s educational Austria Piece by Piece series, Oberösterreich is the last of Austria’s nine provinces to be celebrated by the children who call it home. 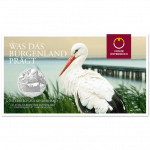 Not only Austria’s most easterly province, Burgenland is also the flattest. Forming the border with neighbouring Hungary, this former frontier land was once known as ‘German West Hungary’, which explains why Burgenland looks and feels different from the rest of Austria. 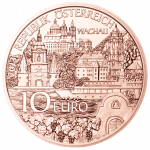 Now located in the centre of the new Europe, this relaxed and sunny province is showcased on the eighth coin in the Austrian Mint’s educational Austria Piece by Piece series. 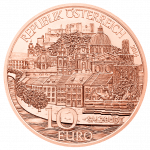 One of the world’s five biggest cities a century ago, Vienna may no longer be the capital of a huge empire but it is still a world leader in terms of its quality of life. 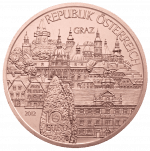 The economic and cultural dynamism, and superb infrastructure of the modern metropolis have led to Vienna being designated the "world’s most liveable city" for the past six years. 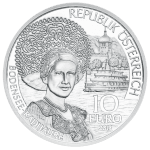 With its glorious past still clearly visible, the Austrian capital is also one of the most beautiful. 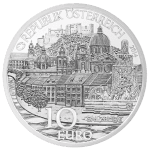 A place of awe-inspiring architecture and a more palpable sense of history than just about any other city on the planet, Vienna is the seventh coin in our eye-opening Austria Piece by Piece series. 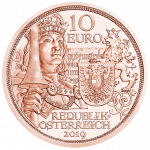 One of the world’s five biggest cities a century ago, Vienna may no longer be the capital of a huge empire but it is still a world leader in terms of its quality of life. The economic and cultural dynamism, and superb infrastructure of the modern metropolis have led to Vienna being designated the “world’s most liveable city” for the past six years. With its glorious past still clearly visible, the Austrian capital is also one of the most beautiful. 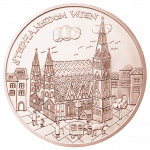 A place of awe-inspiring architecture and a more palpable sense of history than just about any other city on the planet, Vienna is the seventh coin in our eye-opening Austria Piece by Piece series. 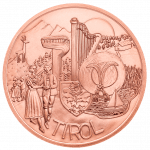 No other Austrian province is as resonant outside Austria as the Tyrol. 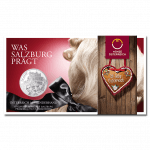 Its famous feathered hats are partly responsible for that; so too are its soaring alpine peaks, which captured the world’s imagination during the 1976 Winter Olympics in the provincial capital, Innsbruck. 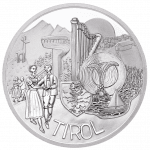 For many those peaks represent the archetypical Austrian landscape, but the Tyrol is far more than that. Steeped in culture, it is Austria’s third largest province and the only one split into two parts, North and East Tyrol. The sixth coin in our educational Austria Piece by Piece series, which was co-designed by the country’s school children, celebrates this enchanting land. 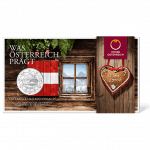 So much more than an alpine paradise, Austria is a federal republic made up of diverse provinces each with a distinct flavour and identity. 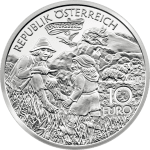 Austria Piece by Piece celebrates that regional diversity by showcasing each Austrian province’s example of UNESCO World heritage, in addition to their unique charm as perceived by their junior inhabitants. 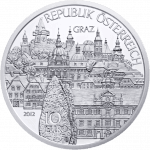 The home of Wolfgang Amadeus Mozart as well as some of Europe’s most spectacular urban landscapes, Salzburg is the splendid fifth silver coin in this engrossing series. 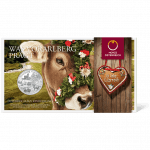 Austria's most westerly province, Vorarlberg is bordered by Germany, Switzerland and Lichtenstein as well as by Lake Constance, one of Central Europe’s largest lakes. No tribute to Ländle, as Vorarlbergers affectionately call their native land, would be complete without der Bodensee, and so the lake fittingly features on both sides of the impressive fourth coin in our Austria Piece by Piece series. 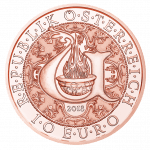 Situated in the north east of the country, Niederösterreich is both Vienna’s immediate hinterland and Austria’s largest province. 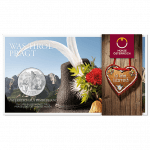 A place where industry and agriculture coexist, it also boasts areas of exquisite natural beauty, none more so than the Wachau. Here, beneath terraced vineyards, ruined castles and ancient monasteries, the mighty Danube forms one of the world’s most spectacular river valleys. 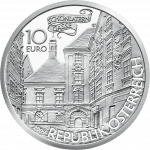 A UNESCO World Heritage site, it makes for the perfect centrepiece of the third 10 euro silver coin in our superb Austria Piece by Piece series. 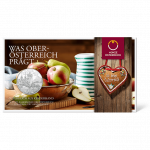 Situated in the north east of the country, Nieder Österreich is both Vienna’s immediate hinterland and Austria’s largest province. 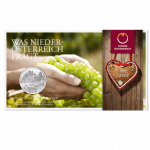 A place where industry and agriculture coexist, it also boasts areas of exquisite natural beauty, none more so than the Wachau. Here, beneath terraced vineyards, ruined castles and ancient monasteries, the mighty Danube forms one of the world’s most spectacular river valleys. 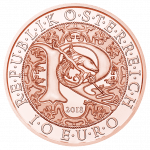 A UNESCO World Heritage site, it makes for the perfect centrepiece of the third 10 euro copper coin in our superb Austria Piece by Piece series. 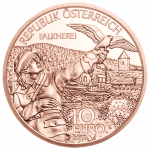 Depicting the nine provinces of Austria seen through the eyes of their young citizens, Austria by its Children is a unique and ambitious ten-coin project supported by the Ministry of Education. 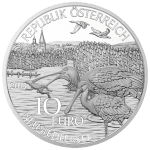 A land of lakes, mountains and summer sunshine, the province of Carinthia – Kärnten – features in all its beauty on the delightful second 10 euro silver coin in the series. 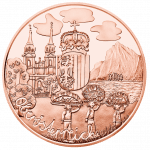 Depicting the nine provinces of Austria seen through the eyes of their young citizens, Austria by its Children is a unique and ambitious ten-coin project supported by the Ministry of Education. 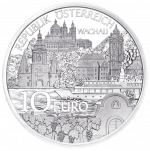 A land of lakes, mountains and summer sunshine, the province of Carinthia features in all its beauty on the delightful second 10 Euro coin in the series. 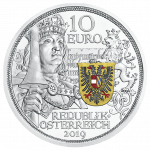 Celebrating the nine federal provinces of Austria, each 10 euro silver coin in the Austrian Mint’s charming series Austria by its Children reproduces the winning design from a competition in which schoolchildren were asked to draw their home province. 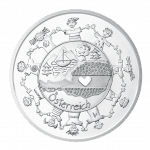 Celebrating the nine federal provinces of Austria, each coin in the Austrian Mint’s charming series Austria by its Children reproduces the winning design from a competition in which schoolchildren were asked to draw their home province. 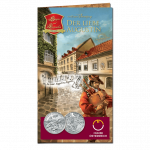 Written in 1679, when Vienna was ravaged by the plague, Oh, du Lieber Augustin is still a popular and inspirational folk song in Austria today. 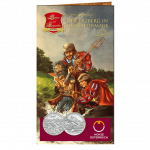 The sixth and final coin in our popular Austrian Tales and Legends series tells its fascinating story in marvellously vivid detail. 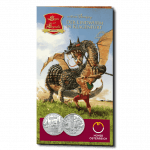 The penultimate coin in our popular Austrian Tales and Legends series is the Lindwurm in Klagenfurt. 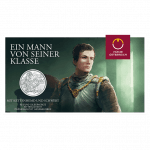 Not only is this spectacular 10 euro silver coin essential for all those determined to complete the series, it is also a miniature masterpiece that makes an ideal gift for all fantasy fans. 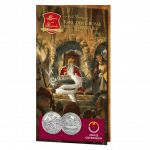 A popular tale from the Middle Ages, Charlemagne in the Untersberg is symbolic of the unwillingness of the people to accept the death of a great monarch. 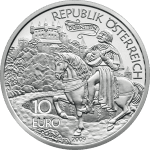 It is also the splendid fourth coin in our popular Austrian Tales and Legends series and a fitting tribute to such an abiding legend. An ancient legend had it that if you caught a merman he would grant you a wish in return for his freedom. 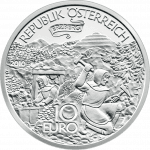 The two miners depicted on the third 10 euro silver coin in our Austrian Tales and Legends series did exactly that and in so doing discovered the Erzberg in Styria. 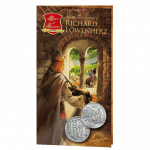 The legend of minstrel Blondel singing his way from castle to castle in search of his master Richard the Lionheart has captivated adults and children alike for centuries. 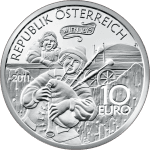 The second 10 euro silver coin in our popular Austrian Tales and Legends series will captivate collectors of all ages too. 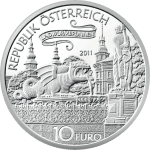 Wonderfully reminiscent of the period it portrays, the Basilisk of Vienna is the fitting first coin in the Austrian Mint’s evocative series, Austrian Tales and Legends. 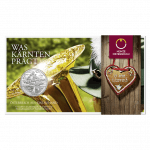 Dating from the 13th century, the classic tale tells of a beast that terrorised the medieval streets of the Austrian capital.